The pie crust was a pain. It kept breaking apart. I guess that’s why they call it flaky. Blend ingredients in food processor until combined. Remove and separate into 2 crusts, Wrap in plastic wrap, flatten and refrigerate for a minimum of 30 minutes. Remove one of the pieces and line a 9 inch pie dish. Set aside. Heat oven to 425 degrees. Melt butter in saucepan over low heat. Blend in the flour, salt, pepper, and thyme. Cook over low heat. Stir in until mixture is creamy and bubbly. Remove from heat. Stir in chicken broth and cream. Heat to boiling, stirring constantly. Boil and stir 1 additional minute. Stir in chicken and vegetables. Pour into a pastry pan lined with a crust. Cover with the second pastry or do lattice strips. The top was tricky and I didn’t have baking cloth to transfer. So I lined the counter with plastic wrap and rolled out the dough, then flipped the top of the crust onto the pie using the wrap that lined the counter. It worked really well. Trim edges, seal and flute. Cover the edges with tin foil so the crust doesn’t overbake. Remove foil 15 minutes before end of baking. Bake for 35-40 minutes or until golden brown. The crust is very flaky. 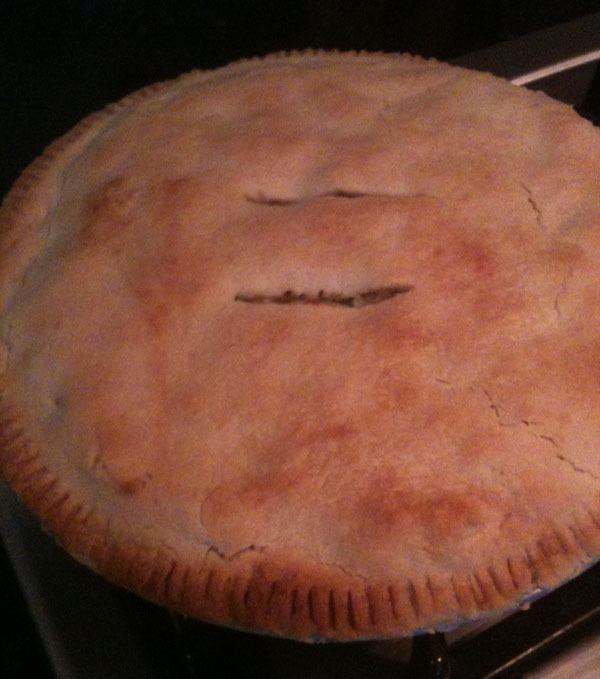 It crumbles when you cut into it and for this pie, I don’t really like it that much. I think it’s because of the vegetable shortening. The rest of the pie tastes really nice and has a good hint of the chiles. The filling is very rich but it tastes good and the turkey is a good choice for the filling.